Living Coasts keeper Jason Keller has been taking photos in his lunch breaks. He took a photo of the first pied avocet chick of the season when it was only a couple of hours old. Just two days later and that first avocet was already exploring its environment at Waders Estuary. There are now three chicks. In addition, Inca terns have chicks and tufted puffins have been busy collecting nesting material – in one case, from the middle of the foaming waters created by the Auk Cliff wave machine. Staff at Living Coasts are hoping for a busy few months. 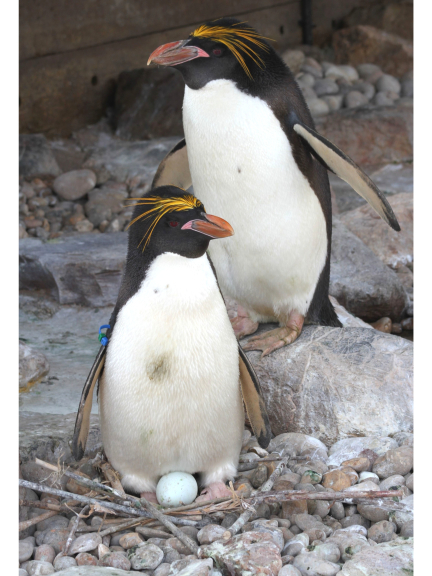 Clare again: “It’s still early days to tell what the season will be like, it has been slow to start but the macaroni penguins are doing more displaying now.” For more information go to www.livingcoasts.org.uk or ring 01803 202470.